If you would like to apply or learn more about how your family can benefit from any of the grant opportunities below, please contact the Admissions team. A special community tuition grant is available for qualifying residents of Boone, Audrain and Callaway counties who wish to enroll in the day school. Applicants must have at least a 3.0 GPA, an excellent disciplinary record and must have lived in the area for at least one year prior to enrollment. With the community tuition grant, the cost of the day school program is $6,500 per year, plus cost of uniforms. Students may be eligible for up to an $11,000 grant, based on their leadership potential. May be used in conjunction with our need-based financial aid. Today's college student debt is directly correlated to the amount of time it takes students to complete their college degrees. Graduating in four years was once the norm, but today the Department of Education is no longer tracking 4-year graduation data and has shifted to tracking 6-year graduation data. Missouri Military Academy addresses this dilemma with our College Readiness Grant. MMA helps students develop the skills needed for success in high school, college, and beyond, and we are so committed to preparing tomorrow's leaders for those challenges today that we offer a $6,000 grant to students who met our criteria for acceptance. May be used in conjunction with our need-based financial aid. In recognition of the sacrifice veterans and military families have made for our country, the NewDAY USA Foundation and Association of Military Colleges and Schools of the United States (AMCSUS) have partnered to provide grants to the children of disabled U.S. veterans and service members. Eligible students can receive up to $30,000 in tuition assistance towards attending a select military school such as Missouri Military Academy. This award can be used in conjunction with other need-based aid. Priority is given to children whose parents or guardians have made the ultimate sacrifice, sustained significant disability, or endured significant disruption to family life due to the demands of military service. Missouri Military Academy is proud to offer the Mexico Community Scholarship to students from Mexico, Missouri, who show leadership potential. The Academy and three other foundations, the Miriam Arnold Edmonston Foundation, the Griffin Family Foundation and the Stribling Foundation, make this scholarship possible so that promising young men in Mexico can attend Missouri Military Academy. Mexico residents entering grades 7-12 are eligible to apply for the scholarship, and selection will be done by a committee composed of MMA and sponsoring foundation representatives. One or more candidates will be selected to receive the Mexico Community Scholarship, which is renewable. Recipients of the Mexico Community Scholarship are known as Stribling Scholars in honor of Mexico and MMA leaders Charles R. Stribling Jr. and Charles R. Stribling III ’44. Charles Stribling Jr. came to Mexico in 1920 to teach at the Academy, eventually becoming its president during the Great Depression, when he managed the school through difficult financial times. He spearheaded an effort to establish the Academy as a nonprofit in 1948 and served as chairman of the board of trustees until his death in 1983. Charles Stribling III was born in Mexico to Charles Stribling Jr. and his wife, Ruth Cauthorn Stribling. Apply to MMA. Candidates must be fully accepted to Missouri Military Academy. Contact Greg Seibert, Director of Enrollment Management, at gregory.seibert@missourimilitaryacademy.org, or 573-581-1776 Ext. 323, to begin the process, or inquire online. Apply online for financial aid. Students are required to complete an interview with a selection panel composed of representatives of MMA and the participating foundations. Want to see where MMA students attend college? 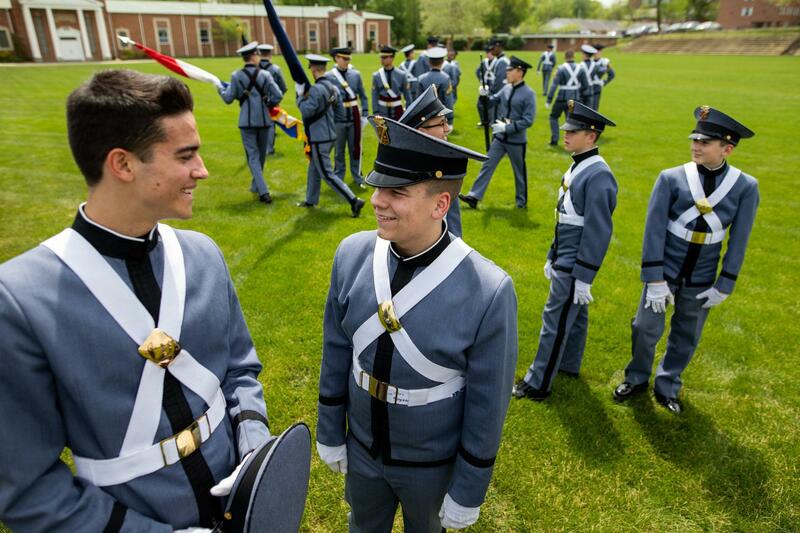 Check out our College Placement office and learn how Missouri Military Academy's 2018 graduating class earned over $6.5 Million in college scholarships!